(In the first weekend of 2009 I was kindly asked by Steve Eifert over at http://www.noiroftheweek.com/ to write a review of the film noir This Gun for Hire. This review is available to be read there. Noir of the Week is a fine website managed quite well by Mr. Eifert, featuring many detailed reviews of classic film noirs. Not to be missed. Frank Tuttle's early film noir, This Gun for Hire, made Alan Ladd a star in the role of Philip Raven, a mentally deranged and psychologically disturbed contract killer. As Raven, Ladd would employ the particular assets that he would continue to bring to his best roles: a laconic mysteriousness and nuanced, cerebral lethality of presence that distinguished him as a rara avis among the quotidian ordinary. Having soujourned for a decade in colorlessly inconsequential parts in approximately forty films, Ladd was finally given an opportunity to demonstrate his captivating talent. Ladd's commanding ubiety in This Gun for Hire is established by Tuttle in the star's first scene, which likewise begins to etch the dour artistry of lighting by Tuttle and cinematographer John Seitz. In a scene to be mimicked by Jean-Pierre Melville for his Le Samourai (1967), the insularly framed lone gunman stays in a slightly unsettlingly empty room. In This Gun For Hire, Ladd's Raven is loving toward only one kind of creature: cats, and when Tuttle's camera captures him smiling, in two of the three cases the predominantly uncharacteristic grin is aroused by the sight of a feline. In Le Samourai, Delon's killer showed love for a pet canary. (Delon would later love cats playing a ruthless spy in the Michael Winner thriller Scorpio.) Le Samourai starred Alain Delon in the role from which Ladd's Raven serves as a template, whose similar first name draws an unintended comparison as well. Tuttle's mise-en-scene is often rather precise, and is repeatedly marked by dazzlingly expressionist chiaroscuro lighting. As Raven holds his tool of the trade, his handgun, the low-angle camera angle accentuates the man's isolation and power all at once. The shadowy lines that span the wall behind him, and framing square and triangular shapes in the wall and ceiling, connote a subtle gradation of entrapment and doom. As piano playing gently seeps into the room, the killer behaves like a man apart, and when a pushy maid attempts to shoo the kitten away from the room's windowsill, he snaps, spinning the woman around and slapping her. As the film continues, Raven's affinity for cats juxtaposed with his moderately bemused, glassy-eyed distrust of and dislike for people will serve as an important implement of narrative and character indicia. In this instance the episode serves to highlight the character's respectful admiration for the feline as solitary animal fighting for its own survival. Later, as he strokes a cat, he will remark that a cat brings luck—which is one of the only universal things he believes in as a force of aid. When asked by the effeminate and rotund man who has last hired him to eliminate a chemist how he feels when working, he callously replies, “I feel fine.” Ladd's delivery is flawlessly deadpan, portraying Raven's coldblooded demeanor as a sort of deeply ingrained psychical state rather than mere remoteness of attitude and feeling. Ladd's physical conciseness and verbal succinctness endows the character's most consistent attributes with a naturalness that seamlessly matches the vision of screenwriters Albert Maltz and R.W. Burnett in their fascinating adaptation of Graham Greene's novel, “A Gun for Sale.” Greene's novel was set in Great Britain, but while the Los Angeles setting significantly changes some of the atmospheric qualities of the film from Greene's book, Tuttle conjures a similar percolating quality to the narrative developments. Tuttle does this by utilizing the visual language of cinema that helped to signify the oncoming flurry of aesthetically attractive and visually communicative 1940s Hollywood film noirs. Tuttle's mise-en-scene is especially sharp in the early and late stretches of the film. A midway excursion into an estate with a thunder-and-lightning storm appears like a horror film. When Raven and Graham are on the run together, Tuttle's camera examines them as an impossible pairing—he is a stoic killer for hire, she is the girlfriend of a police detective named Michael Crane (a feckless Robert Preston) trying to solve a robbery from which Gates has paid Raven with marked bills. The compilation of multiple threads tying into one knot is one of the more satisfying, but possibly distracting aspects of This Gun for Hire's narrative. As Raven and Graham are physically adjoined to one another, with Raven on the run from the police as he attempts to exact revenge for Gates' double-crossing, This Gun for Hire slows down and the screenplay endeavors to explain the chief source of Raven's psychological trauma. Visually and thematically dark, the scene is lit with expressionistic intensity. As Raven and Graham look out through the gaps between wooden planks in a filthy warehouse window, the light skips down diagonally on the two. As Raven describes a recurring dream in which a tyrannical woman continually beat him as a child. This legitimate effort to create melodrama out of the hitman's origins of spiritual, mental and physical (the permanent scarring on his left wrist is used by the police to identify him) disrepair and wounds is successful in creating an empathetic attachment to the character when he continues to run away from the police. As the police struggle to locate the elusive Raven, the film takes a pessimistic but almost lightheartedly comic shot at the cops as bungling and ineffective. Raven rather easily escapes the clutches of the cops who know he is aboard when he exits the train. Over the course of the film, policemen make tragicomic mistakes when attempting to capture Raven. In one such especially personal confrontation, a lone policeman tries to handcuff Raven late in the film, only to fatally underestimate the killer, who shoots him to death for his trouble. Quite late in the film, as Raven tries to satisfy his blood lust, he finds himself looking directly at Detective Crane, who he could have effortlessly eliminated—but he knows he is Graham's man (“You're a copper's girl,” he once dismissively sneers)—and consequently spares him. Graham's gentleness and kindness toward Raven endears her to him and when a villain suggests she ought to be killed, Raven furiously comments that she has been “nice to me,” a most sparse—and perhaps, the film seems to subtly suggest, nonexistent—way in which someone has ever treated him. With a plot that veers perilously close to making This Gun for Hire another propaganda picture—in which even the stone-hearted assassin is finally moved to defend his country from despicable traitors—the screenplay and Tuttle's interpretation of it keep the dilemmas and choices personal and almost disconnected from politics. As with other Greene novels, it is the personal that informs the politics of the story, and This Gun for Hire is finally, gratifyingly, no different. This Gun for Hire's climax would also be borrowed by Jean-Pierre Melville for his Le Samourai as the hunted killer is chased on an ominous rail bridge. As Ladd's Raven once again outmaneuvers the police, Tuttle captures the entire chase sequence in a bravura depiction of action. The memorable long shot of Raven jumping off the rail bridge onto a moving train is exciting, and the interest and care the audience has for Raven makes it genuinely meaningful. 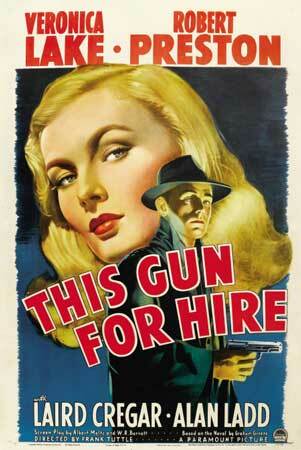 This Gun for Hire is an early film noir and its limitations and imperfections—some of the supporting players give uninspired performances and Tuttle's direction is somewhat lax in the film's midsection, as is the screenplay—while not to be overlooked, should be considered with fairness when assessing it. As such, this is a most thoughtful, interesting and important film. Having just seen this last week - in the theater and for the first time - it's a real treat to see it get the AC examination. I was as impressed with the lighting as you are, which is saying something considering I don't have a trained eye to see things like that. I loved Cregar as Gates, and the last 10-15 minutes were a real hoot (even though the cop killing was a little bizarre by a character for whom we're supposed to feel sympathy). And excellent point (as usual, missed by me) about this not being a propaganda film. You are the noir master, sir. Thank you very much for all of the kind words, Daniel. Cregar as Gates is just a little like a poor man's version of Sidney Greenstreet in The Maltese Falcon--humorous, slightly threatening (though much less so than Greenstreet), and significantly goofier/more cowardly. Thank you again for the very kind words, Daniel--and I'm most happy that this review and your viewing of the film coincided so perfectly. Graham Greene's story was in his own estimation, an 'entertainment', and the rather weak ending is hard to credit, as is the clumsy attempt at psychoanalysis. The film's strengths lay, as you rightly identify them Alexander, in Tuttle's pioneering mis-en-scene and night-for-night shooting - especially the opening scene in Raven's room and the chase sequences in the factory & rail yards - and in Ladd's breakthrough portrayal. The Gates character I found a little too cliched. I will come back to this again later tonight. This is certainly a great noir, and one that richly deserves this kind of thorough treatment. As far as your lead-in, I couldn't agree with you more. I also have the same problems on a daily basis, and frankly can't quite keep up with my plans at WitD, which are largely carried by my astonishingly prolific colleague Allan Fish. I know you love to write (and you are a fantastic writer for sure) but alas, there are other things in life that must often take precedent. Work at your own pace, and know you need to spread yourself out in a number of directions. Having said that, I look forward to your late February plans for some recent films, as well as your ongoing consideration of the backlog. As always Best Wishes to you my friend. Thank you for the kind words, Tony and Sam. Yes, Tony, we certainly do agree about Tuttle's fine craftsmanship and pioneering mise-en-scene. This is an important film noir for these reasons, in any event. You're also right about this being viewed by author Graham Greene as simply an "entertainment"; some parts of it are rather disjointed, but Tuttle and the screenwriters do a commendable job of adapting it to the screen. Sam, yes, my friend, thank you for the best wishes. As always it means a lot. You're right, of course, blogging demands a certain amount of attention that cannot always be invested. Thank you for being determined to read this tonight and for looking forward to my upcoming batch of pieces. Best wishes to you as most cinephiles now look forward to the offerings 2009 has in store for us. "it's a real treat to see it get the AC examination." "nuanced cerebral lethality of presence"
You are quite right and ever-observant to note the film's "expressionistic, chiaroscuro lighting" and john Seitz's stunning cinematography. Later you make a terrific point bringing in the "low angle camera angle" and the "isolation." And again, as pounded home many times by our friend Tony D'Ambra at FilmsNoir, the themes of "entrapment/doom" always seem to pop up in most of the major noirs. That was very astute of you again bring up the Melville borrowing of teh ending for LE SAMOURAI. Some of your other fasinating sub-discussions included LE SAMOURAI as a "propaganda piece", the recurring dream, the various confrontations and mistakes woven into the plot (I remember that mistake, that resulted in the death of the cop) and the psychological insights. A tour de force of a review. And excellent comparisons with Melville's LE SAMOURAI as well, with the cat infatuation in GUN and the pet canary one in in the Melville. Fantastic review of a great but not perfect film, Alexander. Like Sam J. says above I really loved all of your insights here. Ladd and Lake are dynamite together. Thank you for all of those wonderful thoughts, Sam. As always I'm fantastically appreciative of all of your remarks. There are many parallels between this picture and the Melville starring Alain Delon; I'm sure there are at least a few I have not covered here. We both love Melville so he's a fine entry point for those wanting to see how influential this American film truly is. The expressionistic lighting is a keystone, and Ladd's performance does indeed bear those trademarks. Thank you for the very kind words, Sam. And thank you as well, Moses. Both you and Sam are correct, of course, as Ladd and Lake are a fine pair in This Gun for Hire. just want to let you know I have passed on the Dardos Award to your blog. Thank you very much, John. I'm quite honored. Thank you, Christian. You should certainly check this one out. The Third Man in Blu-ray... My brain is overloading at the mere thought of it. I need that now! Cool story as for me. I'd like to read something more about that topic. Thanx for posting this info.